"This book is to be neither an accusation nor a confession, and least of all an adventure... Thus begins All Quiet on the Western Front by Erich Maria Remarque. It is the story of several young German men who are coerced into enlisting in World War I by their teacher. This is a story about war from the perspective of the young soldiers, most of whom will never see twenty. These young soldiers quickly learn that they have more in common with the enemy soldiers than they do with the officers or their families back home, that there is no 'right' or 'wrong' in war, no 'heroes', just 'winners' and 'losers', and, most important, that, no matter the outcome, whether they live or die, their young lives are over. 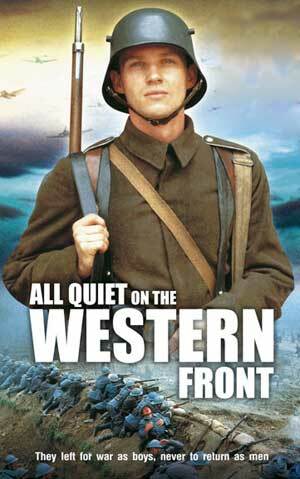 "All Quiet on The Western Front is considered the greatest war novel of all time; it is also the greatest anti-war novel of all time." It was banned and burned by the Nazis.